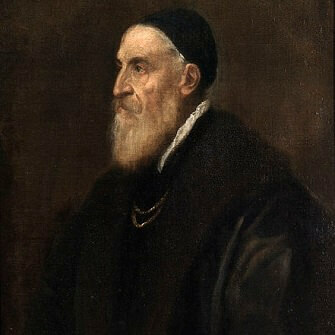 Titian was born Tiziano Vecelli or Vecellio in Cadore, in the Republic of Venice, some time around 1488 to 1490. His exact date of birth is unknown, and he is thought to have misinformed people of his age during his lifetime. He was one of the most versatile and adept of the Italian Renaissance painters, particularly admired for his skill with colour and fine brushwork. He painted a wide range of subjects, from landscapes, to portraiture, to spiritual or mythological scenes, and his style, though changing dramatically over the course of his lifetime, continued to show his perfect understanding of colour and tone. In his lifetime, he was second only to Michelangelo in fame and success, and was the first painter to paint primarily for an overseas clientèle. He gained commissions from royalty and important people around Europe, who recognised the greatness of his talents. At the age of ten or twelve, Titian arrived in Venice to start his training. He studied under Gentile and then Giovanni Bellini, leading artists in the city. It seems he showed a lot of talent, even at his young age. Some early works include the fresco of Hercules, situated in on the Morosini Palace, Gypsy Madonna, and the 'Visitation of Mary and Elizabeth'. The Man with a Quilted Sleeve is said to be another work from this period which is particularly well-executed, especially in the texture of the sleeve. The composition was later emulated by Rembrandt in his self portraits. After this early training, Titian joined one of his contemporaries, Giorgio da Castelfranco, known as Giorgione, as an assistant. There is still much contention today in attributing works to one or other of these two masterful painters, as their style is very similar. 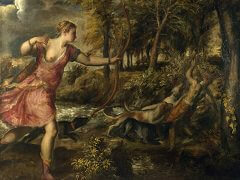 At the time critics commented however that Titian, the assistant, produced the more impressive work. Still, both were and are lauded as leaders of the arte moderne movement. This new style of painting was characterised by a new freedom in style and composition, a rejection of the formal symmetries and hierarchical representation still found, for example, in the works of their old tutor, Giovanni Bellini. There was, it seems, a certain rivalry between the two men, though the similarity between Titian's early style and Giorgione's is proof of their closeness. When Giorgione tragically died young, in 1510, and another of Titian's successful contemporaries, Sebastiano del Piombo, moved to Rome, Titian was left unrivalled in Venice. During his life it was said of Titian that he was a sun amongst minor stars. It was during this time that Titian really came into his own. His style was still heavily influenced by Giorgione, but he began to experiment more with his own style, developing bold, confident flair with a brush. 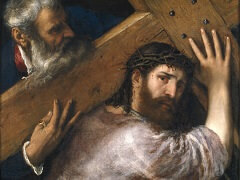 For over sixty years, Titian was to be viewed as a masterly painter, without peer in Venice. 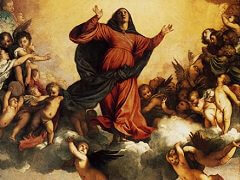 In 1516, Titian created his masterpiece, Assumption of the Virgin for the Basilica di Santa Maria Gloriosa dei Frari. It is still there today. This was the first of a series of framed altarpieces, which culminated in the perfectly conceived 'Pesaro Madonna', in which a classic formula was achieved. This formula has been much studied and emulated by later artists. Titian was at the height of his skills, and became well known not only for his religious work, but also for his portraiture, for example, 'La Schiavona' and many of Pietro Aretino, an outspoken thinker who championed Titian's work; mythological scenes like Bacchus and Ariadne, and his half-length or busts of women, examples of which include Flora and Woman with a mirror. In this period, he gained much attention from Dukes of the North Italian Courts. 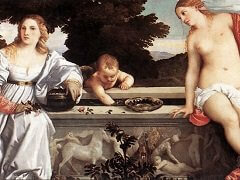 In the 1420s Titian had four children with his paramour, then wife, Cecilia. 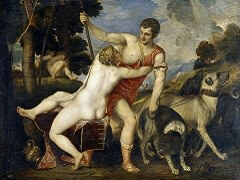 Titian had lived happily with Cecilia and had two children out of wedlock. They married when she was gravely ill. Fortunately, she recovered. They had two more children but, sadly, she died in childbirth only a few years after their marriage. Titian's reputation grew, and spread, throughout the following decades. His understanding of colour continued to be unmatched, as is particularly evident in such works as Danae, and the reclining Venuses, including the Venus of Urbino, some of the fleshy nudes for which Titian became well known. His versatilities too, was impressive, as he continued to produce a huge variety of different types of painting, from the religious to the profane. He could paint royalty or artists, or beasts, with the same attention to detail and beautiful fluid brushwork, and tackled Madonnas and lowly prostitutes with the same aplomb. Titian gained yet more influence as time passed, completing works for the Pope, Paul III, and Charles V. He was given the title of Count Palatine and was made knight of the Golden Spur. His children were also ennobled and he was granted the Freedom of the City of Rome during a visit of 1546, when he also finally got the opportunity to meet Michelangelo. 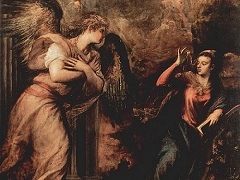 Mannerist aspects in Titian's work increased after this meeting. For much of the rest of his life, Titian worked for Charles V's son, Philip II of Spain, and his later works are characterised by a free and assured style that led one of his pupils to say that he worked more with his fingers than his brush. He lived a long life, but died of the plague in 1576, and was interred in the Frari Basilica. As a portraitist, Titian is often compared to Rembrandt and Diego Velazquez. It is said that his portraits prefigured the internal life and depth of the former, and the clarity and certainty of the later. Titian knew paint like no other, not sketching, but working, and reworking, the paint directly on the canvas, with surety of colour mixing and brushwork that was second to none. His bold use of colour has influenced countless artists that followed him, not just immediately afterwards, but well into the 20th and 21st Centuries. His composition was also very influential on artists throughout the 16th-18th Centuries, and has been widely studied since. Without a doubt, Titian belongs among the top-tier Renaissance artists, and his name has become synonymous with the best of the Renaissance Art. Along with Leonardo da Vinci, Michelangelo,	Donatello, Shakespeare, and a small band of contemporaries, Titian become the center of a movement of artists that has permanently enriched western culture. Titian's groundbreaking use of bold, brilliant colors, his striking and powerful composition, and his loose, revolutionary brushwork inspired many generations of artists, including Rembrandt, Caravaggio, Peter Paul Rubens and van Dyck. Few artists have had such a profound and far-reaching influence on the art world.